The Enfield Republicans worked on a project for the local KITE/Stowe Family Teacher Organization a couple of weeks ago, which was just as much fun for them as it will be for the children. The request was to drill holes in plastic bottle caps for the Pre-K children for a variety of art projects. 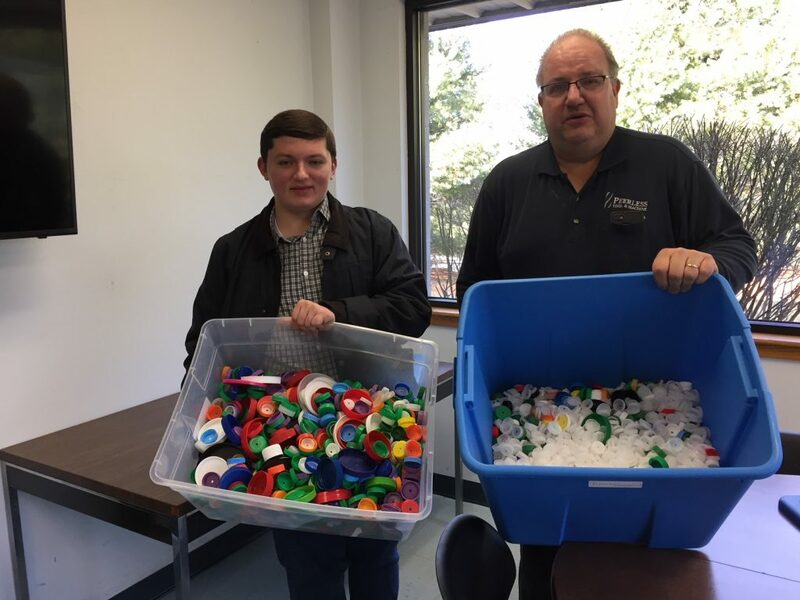 With the help of Walter Kruzel, President of Peerless Machine Tool, thousands of caps in a variety of shapes and sizes were sorted and drilled by a group from the Enfield Republican Town Committee. The drilled caps were redelivered to the school and the beautiful creations were started. The children in the Play Lab have been stringing the caps and the artwork is being hung around the building. The project is to help with fine motor skills, decision-making, creativity, and learning through play. There was also discussion about promoting recycling with the children and other kindergarten classes will be making their own creations on the field trips to the “play lab” during the year.